Citation Information: J Clin Invest. 2007;117(12):3684-3695. https://doi.org/10.1172/JCI32504. Little is known about whether bone marrow–derived circulating progenitor cells (BMDCPCs) can transdifferentiate into adipocytes in adipose tissues or play a role in expanding adipocyte number during adipose tissue growth. Using a mouse bone marrow transplantation model, we addressed whether BMDCPCs can transdifferentiate into adipocytes under standard conditions as well as in the settings of diet-induced obesity, rosiglitazone treatment, and exposure to G-CSF. We also addressed the possibility of transdifferentiation to adipocytes in a murine parabiosis model. In each of these settings, our findings indicated that BMDCPCs did not transdifferentiate into either unilocular or multilocular adipocytes in adipose tissues. Most BMDCPCs became resident and phagocytic macrophages in adipose tissues — which resembled transdifferentiated multilocular adipocytes by appearance, but displayed cell surface markers characteristic for macrophages — in the absence of adipocyte marker expression. When exposed to adipogenic medium in vitro, bone marrow cells differentiated into multilocular, but not unilocular, adipocytes, but transdifferentiation was not observed in vivo, even in the contexts of adipose tissue regrowth or dermal wound healing. Our results suggest that BMDCPCs do not transdifferentiate into adipocytes in vivo and play little, if any, role in expanding the number of adipocytes during the growth of adipose tissues. No GFP+perilipin+ adipocytes were detected in the adipose tissues of mice fed a normal diet. Adipose tissues were harvested from C57BL/6J mice that had received BMT from GFP+ mice 2 months previously and then fed a normal diet for the 2-month period. 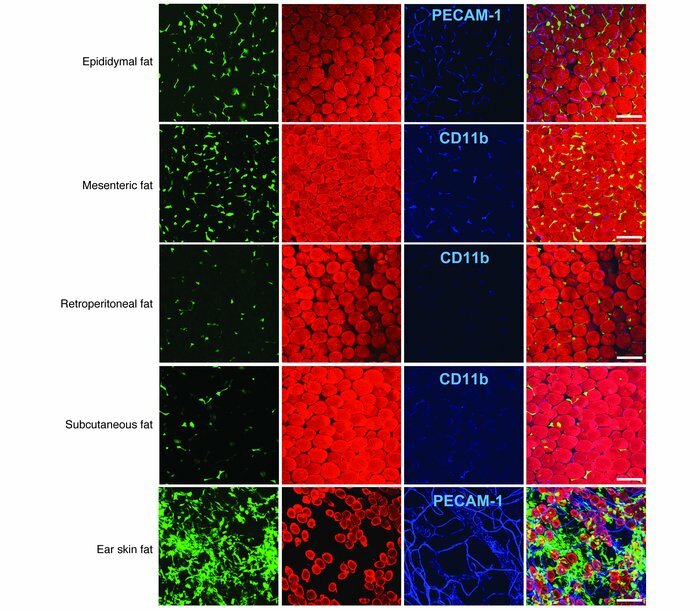 Tissues were whole-mounted, coimmunostained for perilipin (adipocytes; red stain) and PECAM-1 or CD11b (blood vessels or macrophages, respectively; blue stain), and merged. No GFP+ cells (green stain) were perilipin+ adipocytes in the adipose tissues; approximately half of the GFP+ cells were CD11b+ macrophages in the adipose tissues. Scale bars: 100 μm.